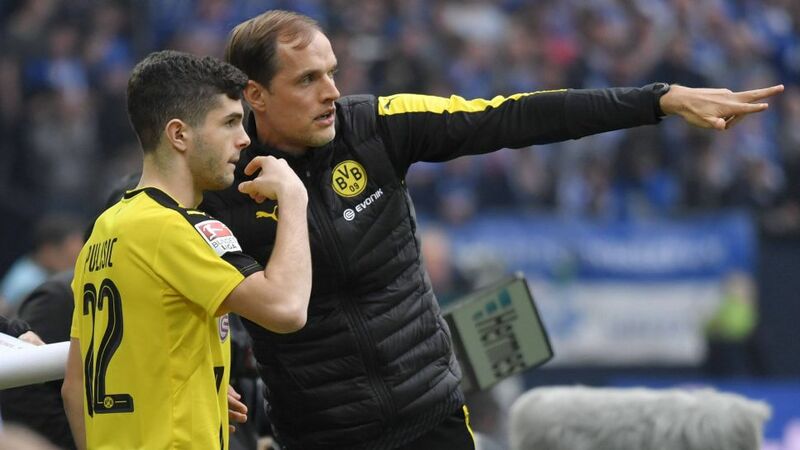 Christian Pulisic has paid tribute to departed boss Thomas Tuchel, thanking his former coach for giving him the chance to launch his Bundesliga career in spectacular style. The USMNT star became the youngest non-German Bundesliga goalscorer and the fourth-youngest ever when he found the net against Hamburg on Matchday 30 of the 2015/16 campaign aged just 17 years, six months and 30 days. He followed that up by scoring against Stuttgart in the very next game to become the youngest Bundesliga player ever to have two goals to his name. Do what many clubs would love to do and sign up Pulisic now! Official Fantasy Bundesliga! The 18-year-old had been handed his Bundesliga bow by Tuchel in the Matchday 19 encounter with Ingolstadt, and eventually featured in nine top-flight matches in total during his and his boss' maiden season at the SIGNAL IDUNA PARK. He built on that with 29 appearances last term, contributing three goals and six assists to Dortmund's third-placed finish, and Pulisic himself acknowledges Tuchel has played a huge part in his transformation from promising youngster to bona fide first-team starter. "I'm just very thankful for everything [Tuchel] did for me," Pulisic said during a promotional event for Panini America on Monday. "Tuchel always just trusted me and gave me a chance. Of course he's given me tips and feedback with what he sees every day in training and stuff like that, small things." Tuchel's two seasons at Dortmund after moving from Mainz featured him giving the youngsters in his squad free rein. Pulisic was not the only one to flourish as Ousmane Dembele was also catapulted to centre stage thanks to a dazzling first campaign in Germany while Julian Weigl has also been a beneficiary of Tuchel's faith in youth. Pulisic believes Tuchel's successor will find a squad in good shape and ready to challenge again next season. "It's tough in professional sports when a coach has to go like this, especially after a pretty good season. But we're excited to see who we get and I think the team will be just fine," said the Pennsylvania-born midfielder, whose season finished with him securing the first trophy of his career with the DFB Pokal win over Eintracht Frankfurt. "It was really special, especially after a tough season like that with a lot of ups and downs. To finish it with a trophy was just a really good feeling. Just to see the excitement on [my teammates'] faces after that was just really amazing to me." The 2-1 victory in the Olympiastadion also marked a happy end to a campaign scarred by the shocking bomb attack made on the squad in the hours before their UEFA Champions League quarter-final first leg against Monaco in April. Watch: Dortmund's wonderkid's three Bundesliga strikes of the 2016/17 season. "It's something that never really goes away," said Pulisic, who is now focussing on the USA's upcoming 2018 FIFA World Cup qualifiers with Trinidad & Tobago on June 8 and then Mexico three days later. "You try to move on from it, but it happened and we're lucky that nothing worse happened. Now we're just going to be thankful, and appreciative that we have life and we're still here." Pulisic was part of the Dortmund side that had to play their rearranged first-leg tie just 24 hours after the attack in which defender Marc Bartra suffered a serious hand injury. Tuchel's team were a shadow of their true selves as they lost 3-2 at home before being beaten 3-1 in Monaco the following week. Pulisic admitted he had not felt capable of concentrating on playing football in the wake of the attack. "Definitely not a day after when we had to play Champions League,” he said. “But as the weeks went by, you move on from it. It's more in the past now of course, and it's not affecting me now that I'm playing or anything like that. It's just something that's always there and it happened."